Will Columbia-Snake River Salmon be Saved? Salmon. You put it on the bbq in the summer, you treat yourself to it at your local sushi joint in the winter, and if you're lucky enough you keep a stash of it on hand for Sunday morning bagels and cream cheese. But salmon is a whole lot more than food; it's an iconic species that is a key link in the chain between environment, recreation, jobs and the economy. 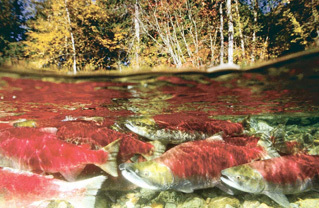 For the last 15 years, federal agencies have continued to put politics before science, circumventing the Endangered Species Act and pushing Columbia-Snake River salmon to the brink of extinction and hurting salmon communities across the Pacific Coast. The plan in question is called a Biological Opinion (BiOp) and it was originally submitted to the court by the Bush Administration. Rather than toss it out, the Obama team made some additions, known as an Adaptive Management Implementation Plan. The State of Oregon, salmon advocates and the Nez Perce tribe of Idaho are suing the agencies, saying the plan doesn't do enough to protect endangered salmon from the harmful impact of dams in the region, and that removal of the four lower Snake River dams in Eastern Washington must be on the table to recover imperiled fish. Independent scientists agree. Last week the Western Division of the American Fisheries Society (WDAFS) released a scientific review of the Obama administration's proposed additions to the federal salmon plan for the Columbia-Snake River Basin. The society's assessment concludes that the addendum, issued by NOAA Fisheries last September and known as the Adaptive Management Implementation Plan (AMIP), is not aggressive, rigorous, or specific enough to help bolster imperiled runs of wild salmon and steelhead. "With this review, the independent scientists of the American Fisheries Society have shed some much-needed light on a topic that has already generated quite a bit of heat," said Jim Martin, former chief of fisheries for the Oregon Department of Fish and Wildlife. "These experts looked at the AMIP and asked two all-important questions: does it do enough to help struggling salmon, and does it utilize the best science? Unfortunately, the answer to both questions appears to be no." The American Fisheries Society is the world's largest and oldest organization of fisheries professionals; its 3,500-member Western Division covers the 13 Western states and British Columbia, including the entire Columbia Basin. Leanne Roulson, WDAFS president, says if fish numbers continue to decline, her group has determined the plan isn't aggressive enough to save them. The Obama administration announced last week that it will, in fact, revise its plan for recovering Columbia River salmon, accepting U.S. District Judge James A. Redden's offer of a voluntary three-month remand, in which he specified that NOAA is obligated by the Endangered Species act to use the best available science. I will not sign an order of voluntary remand that effectively relieves federal defendants of their obligation to use the best available science and consider all important aspects of the problem. This court will not dictate the scope or substance of federal defendants' remand, but federal defendants must comply with the [Endangered Species Act] in preparing any amended/supplemental biological opinion. A coalition of conservation and fishing groups agrees. 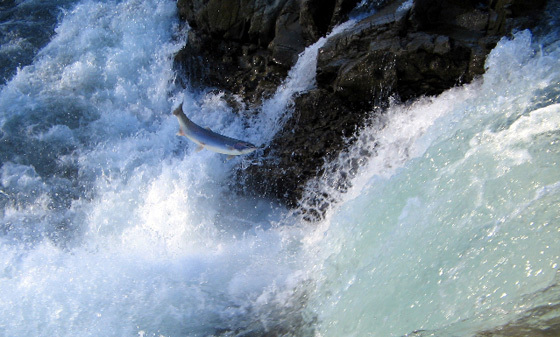 "The first order of business with the Endangered Species Act is to use the best science," said Nicole Cordan, policy and legal director for the Save Our Wild Salmon Coalition. Between WDAFS's review and last week's court decision, the Obama Administration now has one last chance to hit the reset button on salmon; we hope they'll take this opportunity to truly fix their plan, and do so in a transparent, open way, using sound science that incorporates the work of WDAFS and other federal salmon biologists such as the experts at the U.S. Fish and Wildlife Service. With true recovery of wild salmon and steelhead in question, fishing and river communities have been left to bear the brunt with unprecedented closures and restrictions from Southeast Alaska to Monterey Bay, California. "We've said it before and we'll say it again: following the science is the only path to a successful, legal salmon plan, and it's also the best way to restore our struggling fishing communities," said Liz Hamilton, executive director of the Northwest Sportfishing Industry Association. A thoughtful, science-based plan will allow for the rebuilding of recreational and commercial fishing jobs, while also protecting other stakeholders throughout the Basin. It's science, but it's not rocket science; we can do this, provided we put salmon biology in the driver's seat where it belongs. With yet another for the Obama administration to revamp its plan, the question is: will the revised version be enough to save these fish from extinction?